It was June 19, 2016 when Anton Yelchin passed away. I remember that being such a sad day for the film community. Yelchin was so young and had so much promise as an actor. Plus, his death was a freak accident, which made it all the more tragic. It was sad to lose such a budding talent, and Thoroughbreds is his last performance on screen. The film follows Anya Taylor-Joy (Split) and Olivia Cooke (Me and Earl and the Dying Girl), who play two teenagers who form an unlikely friendship after having grown apart. They work together to solve both of their problems, which ends up going to some extreme lengths. I tried to stay away from the trailers, so I didn't know too much about the story going on. I love all the actors in it, and I was looking forward to seeing what they would turn in. 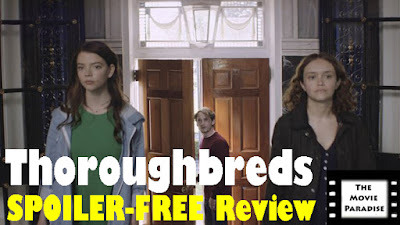 Thoroughbreds is a solid movie with great performances, though it is a little bit too slow at times for my liking. 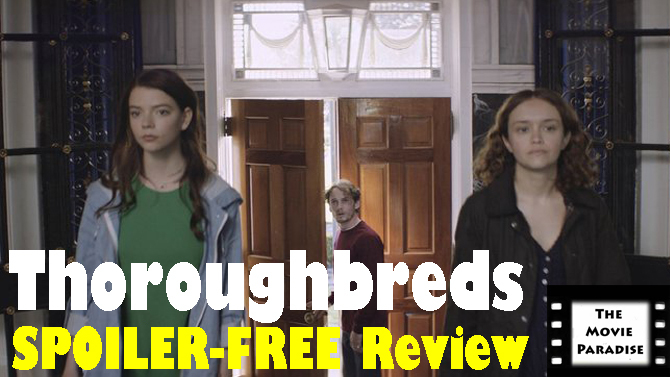 Thoroughbreds shines as much as it does because of the collective work of the ensemble. Anya Taylor-Joy and Olivia Cooke once again prove that they are some of the best new-generation actors in Hollywood right now. Cooke's character does not feel any sort of emotion or pain, which is a fascinating contrast to Taylor-Joy's character who feels too much. The characters are able to compensate for the other's weaknesses in order to further their own agendas. Cooke and Taylor-Joy have fantastic chemistry, and deliver on some riveting scenes. They are very nuanced and layered performers, who have both turned in an equally broad portfolio of work. They continue to impress me with each film they do, and I am sure we will continue to see them pop up in movies for a long time. However, with that said, Anton Yelchin steals the spotlight every time he is on screen. It is hard to watch him sometimes because Yelchin so effortless turns in a killer performance that it really begins to set in that we won't get to see any more of these brilliant performances from him. Yelchin radiates on screen, and at least we have one final great performance from him, instead of him going out on a low note. However, his character disappears from the film two thirds of the way through. He is absent from the third act, which feels strange. There is not a very strong reason for why he is absent. They explain it, but I would have preferred him to have been in the movie for its entirety, as he is easily the best part of the entire film. While the performances are great and the concept is intriguing, the film is just too slowly paced for me. The issue with the movie is not that scenes needed to be cut out; I was fine with everything present on screen. The issue is the pacing, and that falls on director Cory Finley. This is his first film ever, so it is understandable that he may not have a concrete understanding of how to pace a movie. Considering the performances he got out of Taylor-Joy, Cooke, and Yelchin, Finley proves he has talent as a director and does have a bright future ahead of him. But with Thoroughbreds, he shows that he does not quite yet have a full understanding of pacing. Once again, it's not that scenes needed to be cut. Rather, the scenes drag out for too long, and the movie takes its time to get to its plot points. Once we get to the end and reach what the entire movie has been building towards, it's underwhelming, considering how long it took us to get there. A slow burn only works if the pay-off rewards the wait, and I didn't quite feel that with Thoroughbreds. The film is only an hour and a half long, but it feels considerably longer, which is not a good sign. This movie could have been electric had it had a faster pace, but with the slow route that it takes, the film meanders far too much for my liking. Overall, Thoroughbreds gives us a great final performance from the late Anton Yelchin. He steals the show, and gives one of the performances I've seen from him. Anya Taylor-Joy and Olivia Cooke have great chemistry on screen, and reaffirm just how talented they really are. With the performances and the writing, Corey Finley does a spectacular job. However, where he falters is with the pacing, which is my main issue with the movie. It takes too long to get to where it's going, and as a result the climax of the film does not feel as rewarding as it should feel. Every scene in the movie is necessary, and it isn't that they needed to cut specific scenes out. Rather, the pace of the film needed to be faster to keep me engaged. Anton Yelchin's character also drops out of the third act, which comes across as unnecessary. It seems like it took more work to explain why he wasn't in the third act than it would have taken to simply include him. And, considering Yelchin is my favorite part of the movie, I would have liked to have seen him present. In the end, Thoroughbreds is a great send-off for Anton Yelchin, but its slow pace holds it back from being a fantastic movie. What do you think? Have you seen Thoroughbreds? If not, are you planning on seeing it? Leave your (spoiler-free) thoughts in the comments section below.